Pictured: Dr. Dominic Chow, wearing lei, is honored in 2013 for his statewide leadership on HIV/AIDS. On May 5, John A. Burns School of Medicine Professor (JABSOM) Dr. Dominic Chow, MD, PhD, MPH, will be receiving an alumni award from the Syracuse University of New York (SUNY) Downstate College of Medicine. He will be acknowledged for his contributions in education, community service and research in HIV medicine and care. Dr. Chow is a 1993 alumnus of the SUNY Medical School. After receiving his MD, he went on to study at Yale and Johns Hopkins University to complete a Combined Medicine/Pediatrics Residency as well as a Masters of Public Health General Preventive Medicine Residency, respectively. He then completed his PhD at the University of Hawaiʻi at Mānoa (UH). Since 2000, Dr. Chow held a number of titles at JABSOM and at University of Hawaiʻi Health Partners, including Professor of the Department of Medicine, Director of the Clint Spencer Clinic and Clinical Professor of the Department of Pediatrics. 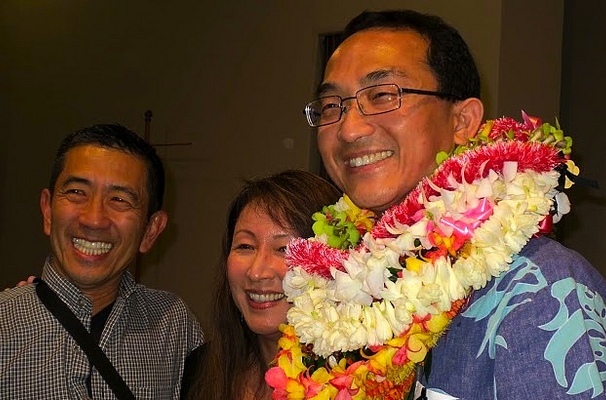 In addition, he is a co-investigator for the JABSOM Hawaiʻi Center for AIDS, a clinical establishment that focuses on research and treatment for those diagnosed with HIV/AIDS. His specialty involves the complications of HIV and the effects of antiretroviral therapy on the autonomic nervous system and cardiovascular system. He also focuses on studying glucose and liver metabolism. Dr. Chow will be honored at a ceremony held at the Marriott Brooklyn Bridge, followed by a luncheon. In 2014, Dr. Chow was also one of six UH Mānoa faculty awarded a “Meritorious Teaching Certificate.” Prior to that, Dr. Chow also received the State’s highest award in AIDS Care and Prevention, the 10th Annual Suzanne Richmond-Crum Award, on World AIDS Day in 2013.